Businesses around the world are under pressure to protect their digital customer and company information as major data breaches in recent years have put a strain on IT teams. In response to these growing threats, many corporations are conducting regular reviews of the data protection measures they have in place. By following this four-step data protection plan, you too can ensure that your company’s sensitive information is protected at all times. Collaboration is the cornerstone of innovation and working together often involves sharing documents and data between teams, locations, even companies. But what if some of your company data isn’t suitable for unregulated sharing? To prevent unauthorised data and document sharing, you should have a strict permission structure in place to determine who can access what data. But before you can do that, you’ll need a way to classify your data based on its level of sensitivity. Microsoft’s Azure Information Protection (AIP) can help apply data classification labels to documents automatically; this is done based on pre-defined rules that detect sensitive information in documents. For example, if a user saves a Microsoft Word document containing a credit card number, they will be prompted to apply the classification label that the administrator has recommended. This will ensure your employees know which documents and emails they can and can’t share with internal stakeholders and external parties. With a classification system in place, you can now define your data permissions. That means determining the level of access each employee has to the different data classification labels. For example, an entry-level employee might have limited access to low-sensitivity data and documents while a senior manager has full access to the company’s most sensitive files. Organising this isn’t as difficult as it sounds. AIP allows you to set a range of permission parameters that define what type of data your employees have access to and how they are allowed to view and share it. For instance, it may prevent unauthorised employees from viewing, editing or sharing a financial report that is restricted to senior management. In this case, approval from a manager holding a higher classification clearance would need to be obtained before the documents can be viewed, edited or shared. Classification-related information is also shown in email headers and footers that notify all recipients when an email is intended for general business data and should not be sent outside the organisation. This adds another layer of protection by ensuring emails containing sensitive data are shared with caution. Encrypting data essentially changes it into a code that makes it undecipherable for unauthorised users. To convert the data back to its usable form will require the right data encryption key. Of course, properly managing access to your data encryption keys is just as important as encrypting your data. AIP makes this process simple by ensuring unauthorised users cannot access encrypted data if they do not possess the appropriate data encryption key. Security systems are as much about monitoring activity as preventing unauthorised access. The same is true when it comes to document and data protection. AIP uses powerful logging and reporting functionalities to monitor, analyse and track shared data activities, and allows administrators to revoke access for suspicious users. This allows you to take real-time action whenever you suspect misuse to prevent and minimise loss of data. With an effective and step-by-step document and data protection plan in place, your company can be confident of operating safely in the digital environment. That will help you sleep well, safe in the knowledge that your sensitive data is being protected at all times. Singtel conducts a series of workshops to help companies understand the gaps between their current IT security and global standards. For more information on implementing the technical solutions required to keep your business safe from email-based cyberthreats, click here. 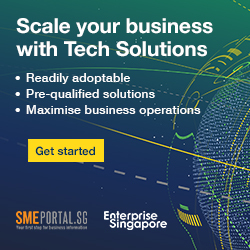 Sign up to receive the latest myBusiness techblog articles every Friday. Its free!